Recipe by: Beef. It's What's for Dinner. 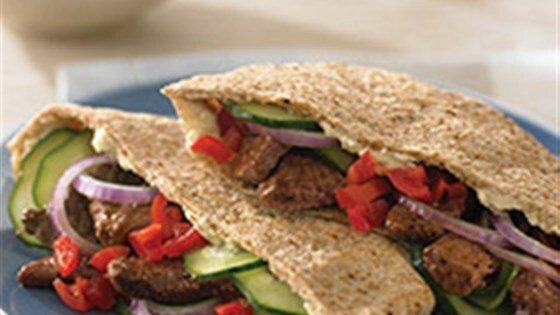 "Stir-fried beef is stuffed into pitas and topped with your family's favorite veggies like cucumbers and olives." Stack beef steaks; cut lengthwise in half, then crosswise into 1-inch wide strips. Combine beef and lemon pepper in medium bowl. Heat 2 teaspoons oil in large nonstick skillet over medium-high heat until hot. Add 1/2 of beef; stir-fry 1 to 3 minutes or until outside surface of beef is no longer pink. (Do not overcook.) Remove from skillet. Repeat with remaining beef, adding remaining 1 teaspoon oil to skillet, if necessary. Spread hummus evenly in pita pockets. Fill with equal amounts of beef and toppings, as desired. Really simple, good and different. I'm not a fan of humus but I spread a thin layer inside the pita and added the goods! I also used pre-sliced stir fry beef. Made some with tzatziki sauce and some with ranch topped with avocado and shredded cheddar. Both options were delicious. very yummy and easy. Reheated it for the second meal we got out of it, and it was still good. I added tomatoes and cucumbers inside without adding the onions. I marinated the steak with soy sauce, minced garlic and lemon pepper.